Some of Louisville’s finest restaurants have cooked up creative ways to give back to the community. Nancy Miller has the dish. Kevin Grangier introduced Celebrity Host Nights at The Village Anchor seven years ago to support local non-profit organizations. He expanded the program to his steakhouse, Le Moo, soon after it opened. The events are now known as Celebrity Host Nights, or Non-Profit Nights, and are held at each restaurant every Sunday and Monday night. “We give the participating group a percentage, usually ten percent, of all sales that evening. Leaders of the organizations are the hosts. What a lot of them have found is that it’s a great way to raise money as well as to bring supporters together in a casual way for the host to visit the tables and capture guests’ attention,” says Kevin. Organizations that have benefitted from the fundraisers that have raised almost $200,000 include Susan G. Komen Kentucky, Best Buddies, Maryhurst, Big Brothers Big Sisters of Kentuckiana, Ronald McDonald House Charities of Kentuckiana, the Arrow Fund, Kentucky Humane Society, Paws with Purpose and the Animal Care Society. Marketplace Executive Chef Zac Young’s Modern American menu has Southern roots and draws on French and Mediterranean influences. He orchestrates a menu of palate pleasers such as mussels in lobster broth, scallops with corn succotash, blackened tuna with tabbouleh and ricotta gnocchi. With a menu that receives rave reviews and an interior that’s full of drama, Marketplace is one of Louisville’s most culinary-forward restaurants, moving from many diners’ bucket list of must-do-soon restaurants to their list of top spots for repeat visits. Among the organizations with which Marketplace is aligned is the Americana World Community Center which creates a safe and supportive community for refugees, immigrants and underserved populations. 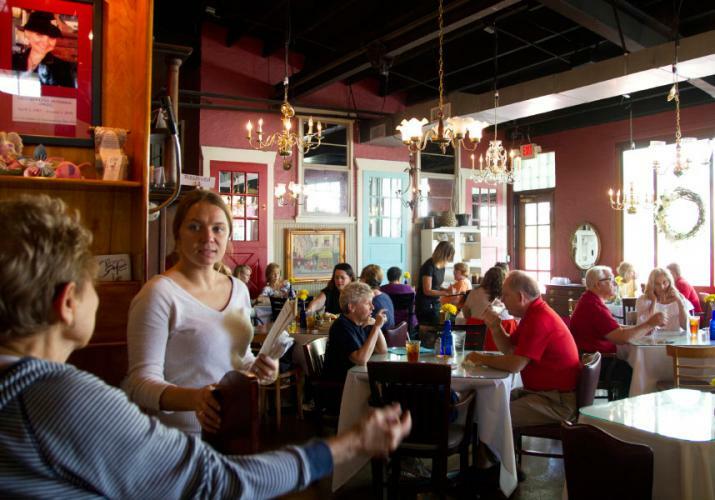 The restaurant also participates in Dining Out for Life, benefitting AIDS service agencies, and House of Ruth, which provides housing and other services for people with AIDS/HIV. In addition, Marketplace works in partnership with Kentucky Opera and supports fundraising activities for the Healing Place, which serves individuals and their families struggling with addiction. 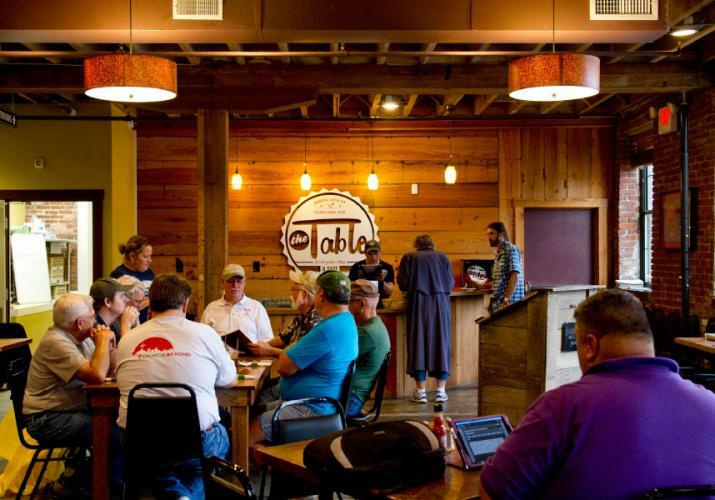 The mission of The Table, a non-profit social entrepreneurship, is formidable: to address food insecurity and provide good, healthy food at affordable prices in Portland. Founded by Kathie and Larry Stoess, and John Howard, the response to the restaurant has been far more than they envisioned. “None of us had experience in the restaurant business. We knew we’d need about 60 paying customers a day to keep us afloat. We do about double that. Sometimes ignorance is bliss. We took a big step of faith,” says Kathie. Guests pay what they can afford. If they aren’t able to pay, they may provide a variety of services, such as washing dishes, serving, cleaning or picking up trash. Customers for whom the cost of the meal isn’t an issue often “pay it forward” by paying a little extra. Chef Laura Rountree’s seasonal menu includes soups, salads and sandwiches. The smoked chicken sandwich is so popular it bridges seasonal changes, and different toppings on smoked pork give a nod to a new season. Fall promises the return of pumpkin chili that proved to be a lunch favorite last year. When Cindy and Sal Rubino operated The Café in the former Louisville Antique Mall, they continually faced the dilemma of finding the right employees. A drug and alcohol counselor suggested they employee people in drug and alcohol recovery. Fast forward to The Café moving to Brent Street. The majority of workers are in recovery through St. Jude Women’s Recovery Center, The Healing Place, Teen Challenge and Volunteers of America. “We aren’t a rehab counseling facility,” says Sal. “We offer only our heart and soul to them. The Café is a safe place that’s conducive to their recovery process.” The Café also hires individuals who are not in recovery from Kentucky Refugee Ministries. Most of the employees in recovery work in the dining room while most of the refugees work in the kitchen, although there are exceptions. The Rubinos place them where they are most comfortable and can make the greatest contribution. The Café’s extensive menu features popular items such as the Louis XIV, chicken salad served on walnut wheat bread; baked ham and Swiss cheese sandwich; stratas (with or without meat); omelettes with a choice of ingredients; Belgian waffles; bread pudding and Italian cream and chocolate tuxedo cake. An 18-month paid job training program teaches baking and hospitality management. Trained Sullivan University culinary program graduates develop products such as cinnamon rolls, bacon and Cheddar chive muffins, donut bites and a variety of sandwiches, and train the women to make them. The program also provides life skills classes, counseling, housing, and group, art and recreational therapy. A case manager works with each woman.